The Tuskegee Airmen, pilots in the 332nd Fighter Group and the 477th Bombardment Group of the U.S. Army Air Corps, were the first African American military aviators in the United States armed forces. The Tuskegee Airmen served in a racially segregated American military in a time when many African Americans were still subject to Jim Crow Laws. Although the 477th Bombardment Group "worked up" on North American B-25 Mitchell bombers, they never served in combat; the Tuskegee 332nd Fighter Group was the only operational unit, first sent overseas as part of Operation Torch, then in action in Sicily and Italy, before being deployed as bomber escorts in Europe. 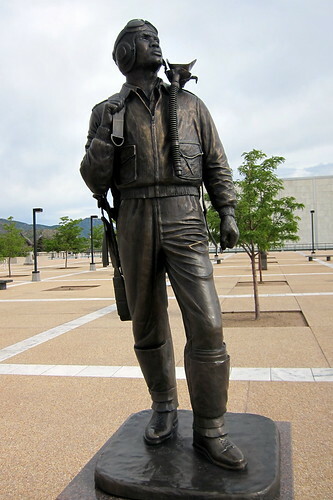 The United States Air Force Academy is an accredited college for the undergraduate education of officer candidates for the United States Air Force. The youngest of the five United States service academies, it was founded in 1959 and graduated its first class in 1959. With a total enrollment of only around 4,500, the Air Force Academy is among the most selective colleges in the country. The campus of the Academy covers 18,000 acres on the east side of the Rampart Range of the Rocky Mountains, just north of Colorado Springs, at a stated altitude of 7,258 feet above sea-level, which is the elevation of the cadet area. The Cadet Area, located approximately four miles west of the Academy's north entrance off U.S. I-25, was designed by Skidmore, Owings and Merrill (SOM) and lead architect Walter Netsch, with SOM partner John O. Merrill relocating from Chicago to a Colorado Springs field office to oversee the construction. Completed in 1963, and expanded from 1965-1968 by the architectural firms of Leo A. Daly, Inc. and Henningson, Durham, and Richardson, the Cadet Area has gone largely unchanged since. The design is notable for its distinct, modernist style--contrasting the traditional designs of West Point and Annapolis--with extensive use of aluminum on building exteriors, suggesting the outer skin of aircraft or spacecraft.